This yellow deck & wall scrub brush is made to be used with our ACME thread wood broom handle, or our flow through telescopic handle. It is great for aggressive scrubbing in hard to reach areas, as well as walls and wooden decks. The injection molded polypropylene block is filled with stiff poly 1-3/4" bristles. 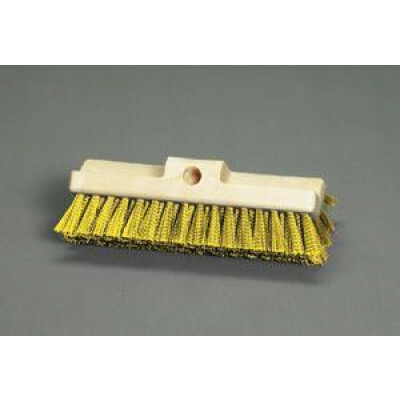 If this brush is not exactly what you're looking for, please take a look at the rest of our deck scrubbing brushes for other options. Customers who were interested in the 3 Surface Yellow Deck & Wall Scrub Brush were also interested in the following items. This is a review for the 3 Surface Yellow Deck & Wall Scrub Brush.